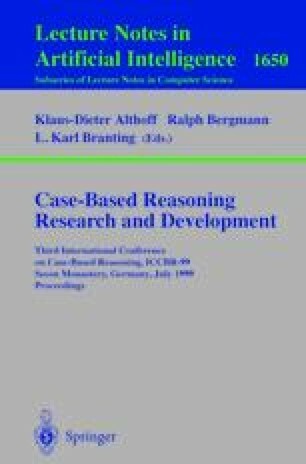 Case Based Reasoning has found increasing application on the Internet as an assistant in Internet commerce stores and as a reasoning agent for online technical support. The strength of CBR in this area stems from its reuse of the knowledge base associated with a particular application, thus providing an ideal way to make personalised configuration or technical information available to the Internet user. Since case data may be one aspect of a company’s entire corporate knowledge system, it is important to integrate case data easily within a company’s IT infrastructure, using industry specific vocabulary. We suggest XML as the likely candidate to provide such integration. Some applications have already begun to use XML as a case representation language. We review these and present the idea of a standard case view in XML that can work with the vocabularies or namespaces being developed by specific industries. Earlier research has produced version 1.0 of a Case Based Mark-up Language which attempts to mark-up cases in XML to enable distributed computing. The drawbacks of this implementation are outlined in this paper as well as the developments in XML that allow us to produce an XML “View” of a company’s knowledge system. We will detail the benefits of our system for industry in general in terms of extensibility, ease of reuse and interoperability.